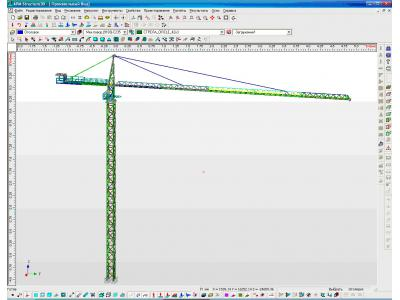 CSE commissioned by the company SEC "APM" performed a set of computational works stationary tower crane Q5015. 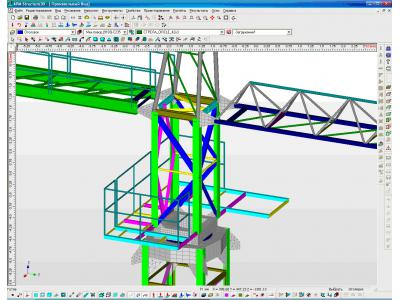 Objective: To determine the characteristics of tower crane for further certification of the relevant authorities for crane operation on the territory of Kazakhstan and the Russian Federation. 1. SNIP 2.01.07-85 * Loads and effects. 2. 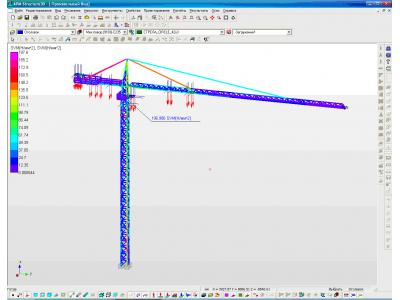 GOST 1451-77 * (2003) Cranes. Wind load. Norms and method of determination. 3. SNIP II-7-81 * (2000) Construction in seismic areas. 4. SNP II-23-81 * Steel structures. 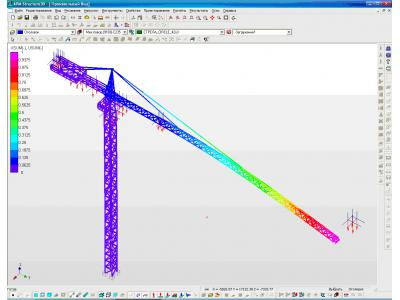 The crane modeled fully assembled using a rod and plate (shell) of finite elements. 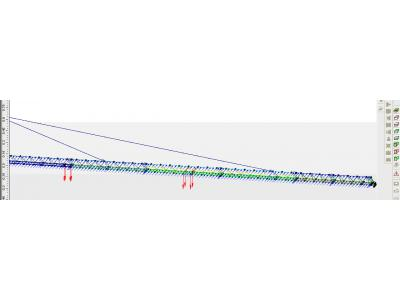 The calculation was made taking into account the dead weight, wind load, seismic area settings payload (load is applied to the boom in four points, simulating the trolley rollers, in accordance with the transfer to the customer loads the schedule). 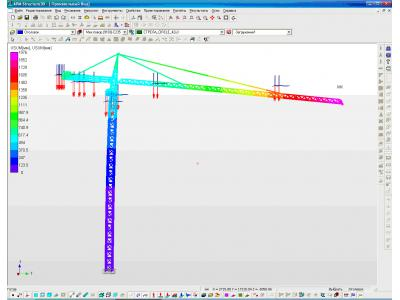 To calculate all possible variants the effect of external factors on the structure 54 created by a combination of loading. 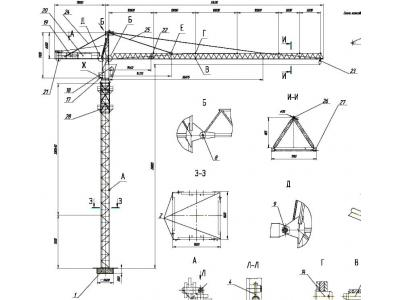 Basic metal parts of the crane with loads to a combination of loads on the pictures shown below. In calculating the identified maximum equivalent strain and displacement, safety factors and the total resistance for the respective load combinations. During the calculation revealed the following feature: in some combinations of loading the maximum equivalent stress of von Mises has exceeded the yield strength of the material, which is the excess of the yield stress is observed in the same place. The cross section of the rod is unequal angles. To reduce the stresses in the rod is necessary to use a composite section from two ravnopolyh corners. 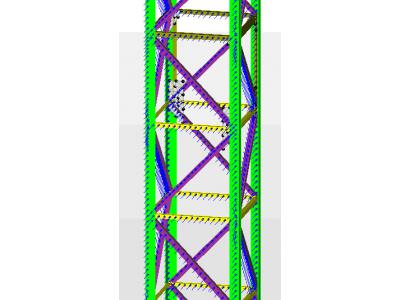 • From the analysis of the calculation results, it follows that the condition of the overall stability of the crane steel structure is performed. The minimum safety factor greater than one and equal to 3.08. 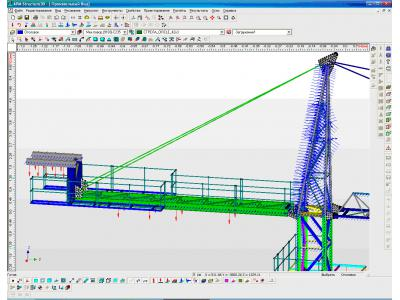 • The maximum equivalent to the movement of the crane metal is 2287mm. 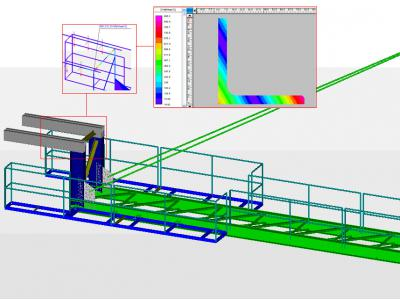 • However, it should be noted that the level of stress for a crane metal models designed for combinations of loads, including seismic effect is very high, and therefore the cross section of the rod was reduced and replaced by a possible area of the crane installations with seismicity to 8 points. 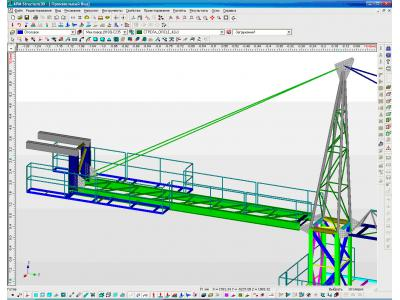 • Based on the results of calculation of VAT crane out of service, it can be concluded that it is also necessary to reduce the number of possible wind region crane installation. By lowering the windshield area to the strength condition IV is performed with a safety factor of 1.58. • Recommendations were also given on the use of materials in relation to possible climatic areas of the crane installation.